As last night we had crashed into bed exhausted at only 21:10, it was not surprising that we were awake early around 6 a.m. and so managed to get Saturday and Sunday’s missives out. We had breakfast in a glass box in front of the hotel, right on the sidewalk, with people rushing to work passing by. Makes a change from breakfast television! In the past we would have raced from San Diego to San Quintin for our first Baja day – quite a stretch. But starting from Ensenada it was a nice leisurely drive along MEX1. Things seemed very lush and green with lots of yellow and orange wild flowers along the side of the road and up the hills. I had expected to spot some Ferocactus viridescens from the car as an excuse for a stop. They are not the most exciting taxon in the genus, but, as a completist, they are a must for a stop. But they tend to be closer to the ground then the lush vegetation, so not spotted from the car. Never mind, there is always the way back in some three weeks time. And so we arrived in the San Quintin area, where SatNav warned us that we should turn west towards the group of long extinguished volcanoes where Dudley anthonyi grows in a very photographic setting of an old lava flow overlooking a marshy coast line. 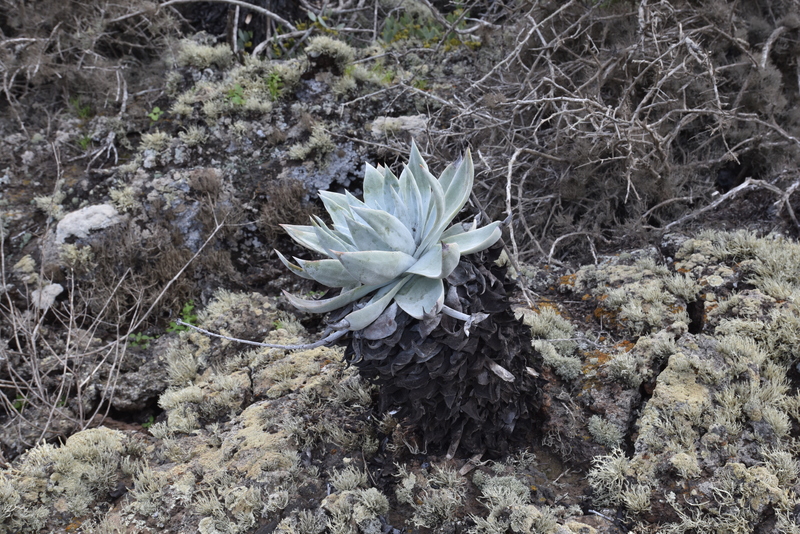 The lava rock is covered in lichen that are worth the visit in their own right and the Dudleya sit proudly on top: dark trunks about the diameter of my arm, covered in the remains of the old leaves, with a large rosette of white farina covered leaves on top. Friends in the UK who are qualified BCSS judges have told me that in cultivation you should tidy the plant by removing the old leaves. If I catch anyone doing that here I’ll report them to the Dudleya anthonyi Protection Society! Dudleya cultrata (?) was here as well, but this is a green leaved plant which blends in with the other vegetation and only calls your attention by its yellow buds. Also found: numerous clumps of Echinocereus maritimus just coming into growth and flower, a Mammillaria that I assume to be M. dioica as there were no flowers or fruits to aid ID. And we did get our picture of Ferocactus viridescens, although Jonathan wonders if it might be F. fordii. I also took many images of the field flowers. I should have remembered their names from previous post trip investigations, searching the internet and the various flora of Baja guides and books. As to the lichen, they are way outside my scope. There must have been at least a dozen taxa here I guess. We stayed at Hotel Mision Santa Maria just south of San Quintin. This was the hotel that Alain and I failed to find in 2008, when in the dark, we drove into wet sand that had been dumped on the track to deal with a minor flood. Our Nissan Altima became firmly stuck in the sand but we were rescued by a group of Mexicans returning from a day’s fishing on the nearby beaches. It is not the easiest of hotels to find, but well worth the effort as it is comfortable and reasonably priced with excellent food. Tomorrow we head into the Catavina Boulder Fields! Eunice had arranged accommodation for us at the Motel 6 in Westminster, CA, clean, safe and convenient. We had agreed to meet up at the Westminster Café, a nice change from the usual Denny’s, although I did have to get used to the large menu which was in a different order. The house number above the door was 6260, which I assumed was the minimum entry age to this diner, so that Angie and Eunice were under age! Dodging zimmer frames and walking sticks we enjoyed a nice breakfast and sticking to our usual up at 7, breakfast at 8, on the road by 9 routine, left right on time. Off to San Diego to pick Jonathan up from his Hotel and start the treasure hunt to find the new location of Dollar Rent A Car. Another nightmare. I explained last night’s adventures at LAX to Maria who promised to sort us out. Yes, there were 5 full size SUVs in stock, just take your pick. We selected a white Dodge Journey with California plates. Then the shock! Some 2-3 weeks ago there had been a merger between Dollar, Thrifty and Hertz. Mexico Insurance, if granted by the insurer was now US$ 48 per day. I checked: did you say Hertz or HURTS? Still, too late to change plans now, so bite the bullet and again after more than an hour of hustling, we were off. At the border crossing we were amazed that we were the only customers at the Mexican Tourist Visa offices. How could that be, with six lanes of cars streaming in? The officials shrugged their shoulders – as did we – no queues! We found our way onto MEX1D straight away and made the usual detour onto MEX1 Libre as soon as we spotted Dudleya brittonia in green and white growing on the road cutting. The white plants must have had some rain, as the white farina had not yet fully formed. Also seen and photographed: Ferocactus viridescens, Mammillaria dioica (in flower) and Bergerocactus emoryi. Agave shawii was here as well but I failed to find a plant nice enough to photograph. Many more opportunities in days to come! In Ensenada I managed to find Hotel Cortez where we had stayed last time, in 2014. A stroll along the shops, where I nearly bought a pair of python skin cowboy style boots, until common sense struck. May be on the way home! Tomorrow we head for San Quintin. After a couple of months of dark and often wet weather we’re off! Nice bright sky as Peter drove us to T3 at Heathrow Airport without any hold ups. Although we had a BA Flight Number, we were directed to the American Airlines desk for check in. Who are they kidding with these multi numbered-all on one plane deals and of course every provider with a different price ticket. During the online check in process we found that Angie and I had been allocated seats at opposite ends of the plane. Not a problem as I tend to sleep most of the way while Angie plays computer games to pass the time. But neither of us had the sought after aisle seats that allows me to stretch my 6ft 4 frame along the isles and so trip up the air hostesses while Angie avoids climbing over people on her way to the toilets. We could change seats, but at £54 per person (and no doubt again on the way back) you have to draw the line somewhere. We did change seats so that we were at least sitting next to each other – me next to the window and Angie on my deaf side. At take off, the aisle seat next to Angie was still empty so a swift game of musical chairs saw her next to the aisle and the central seat empty for stretching. Great! and all for free. We arrived at LAX two minutes early; this was all going very smoothly, until …. we hit immigration! Lots of signage to say that US Citizens and folks like us with ESTA approval could go to the automated control stations, except that there, a man directed all non-US passport holders to the ‘visitors stations’. This coincided with the arrival of a number of mega airliners from China so that we still had to endure the mega-shuffle to the manned kiosks where eventually we were welcomed into the US. That was the first 75 minutes on US soil. Eunice was there to meet us, having anticipated the queueing. We loaded our luggage in Elsie, her Land Cruiser that had been our home on various trips since 2008 and headed to Dollar Rent-a-car as this was the only car rental firm in California as far as we were told that allows rented cars to be taken into Mexico, at an additional cost of US$ 27.50 per day. The rate had changed from US$ 15 in 2008, but comparing total rental cost with those in Mexico were still slightly cheaper. While queuing an irate customer came in, loudly insisting on seeing the Manager. She had paid for an SUV, only to find that there were none to be had! Slight concern, as that was the type of car that we needed. After completing the pile of paper work – during which the strongly recommended International Driving Permit and the new Unique Driving Licence number for UK drivers were NOT required, off we went to find a car. The lady had been right. Their stock was down to – (yes, minus!) 36! We could wait until the next car was returned, checked and cleaned inside and out, expected to take another hour OR take a KIA van: similar size to an SUV but no 4×4 and less clearance. I negotiated to take one so that we could at least go to the Naples Rib Factory where last year I had enjoyed one of the best steaks, washed down with a Blue Cadillac Margarita. These trips are not all about food and drink, but there are standards to maintain! We could swap this for an SUV at San Diego the next morning. We had to pick Jonathan Clark up at SD, so the car swap was not too much of an inconvenience. The steak was excellent. We even got a US$ 10 discount voucher to celebrate the fact that we had visited them 12 months earlier!